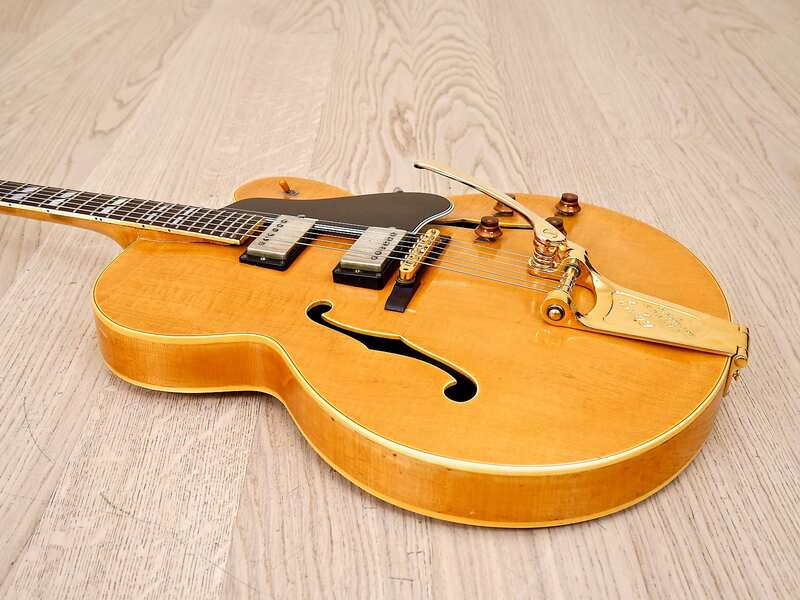 Up for sale, a 1957 Gibson ES-350T thinline hollowbody electric guitar in excellent condition and in perfect working order, complete with the original PAF pickups. 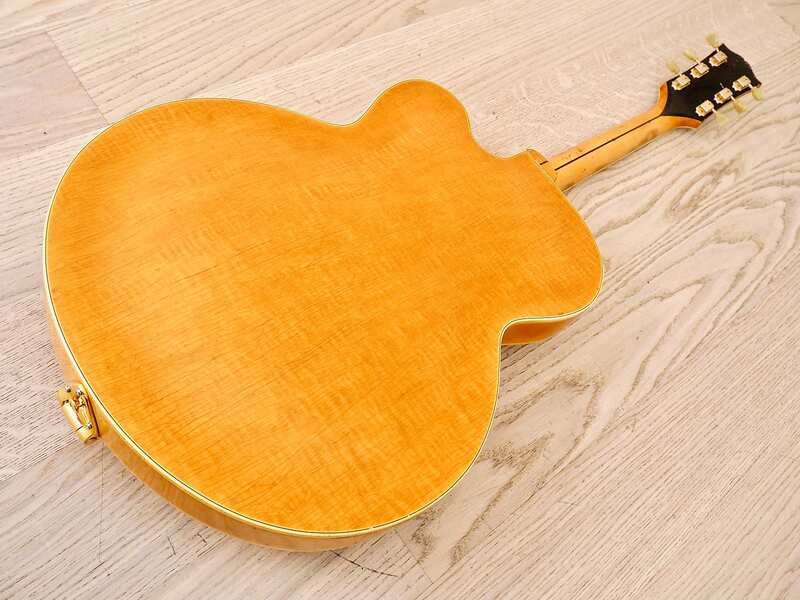 Produced at the pinnacle of golden era Gibson production, this full 17" archtop has a heavily figured maple body with deep ripples of curly flame highlighted by the upscale natural Blonde finish. 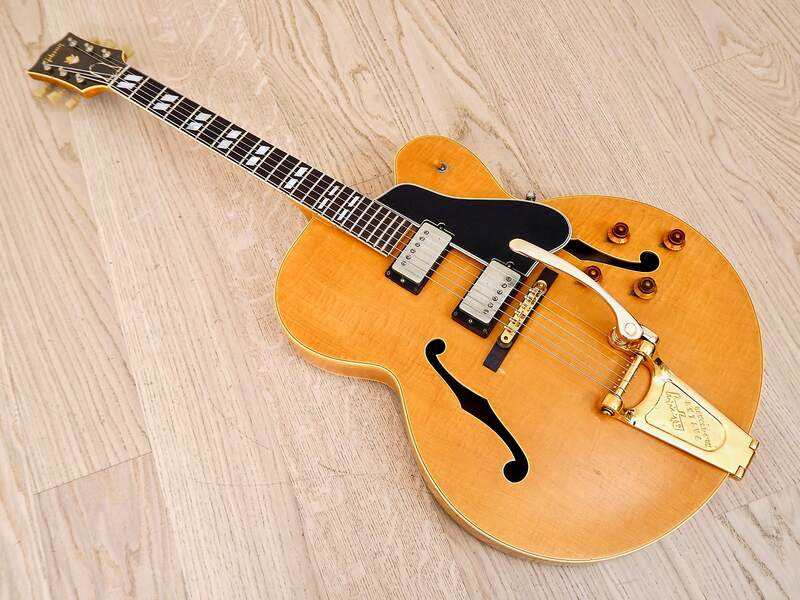 Essentially a slightly more Spartan version of the Byrdland model, the ES-350T boasts its original pair of Patent Applied For humbuckers. 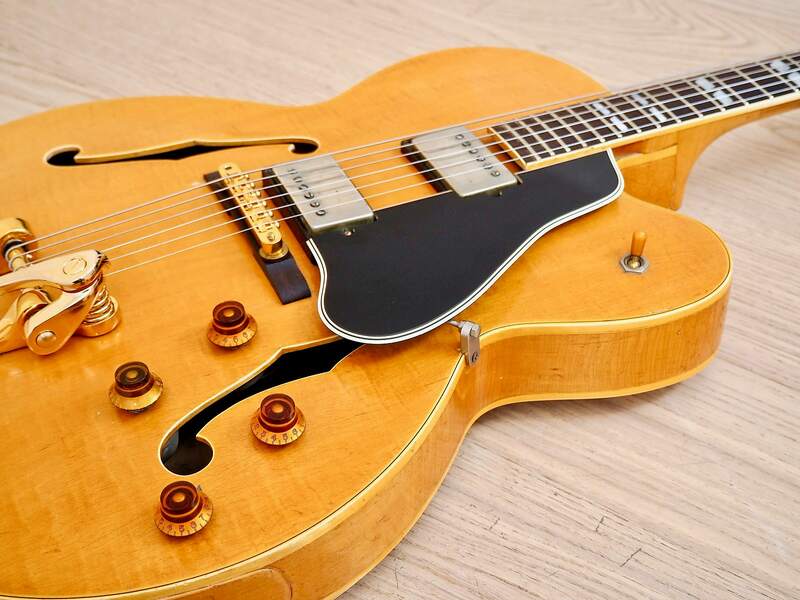 As the most revered pickup design of all time in most circles, these PAFs deliver articulation, complex harmonics, and even, smooth tone that's truly in a class all its own. 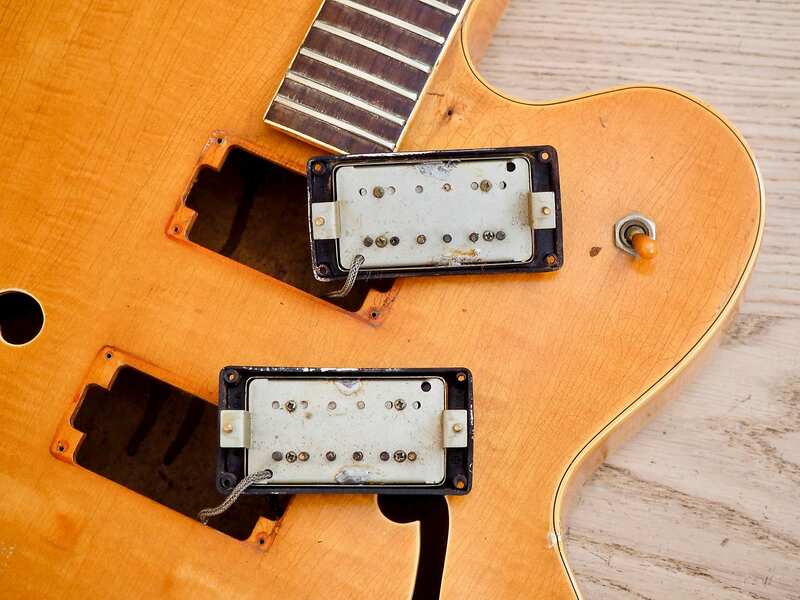 A very early pair of PAFs, these pickups are a textbook example of Gibson's original pickup winding maxim, "we wound them until the bobbins were full," with each pickup reading just over 10k ohms. 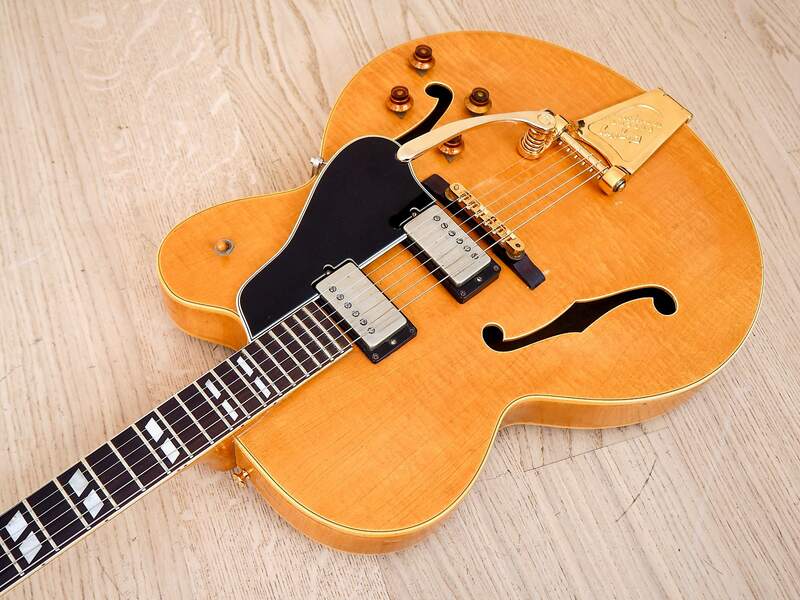 The bridge pickup is sweet sounding and detailed, with a particularly full and even quality that lends itself to creamy overdrive equally as well as complex Jazz chord voicings. The neck pickup is pillowy and warm, and notes have a rich, smooth bloom while still retaining excellent string to string balance and note separation. The guitar weighs in at 6lbs 10oz. 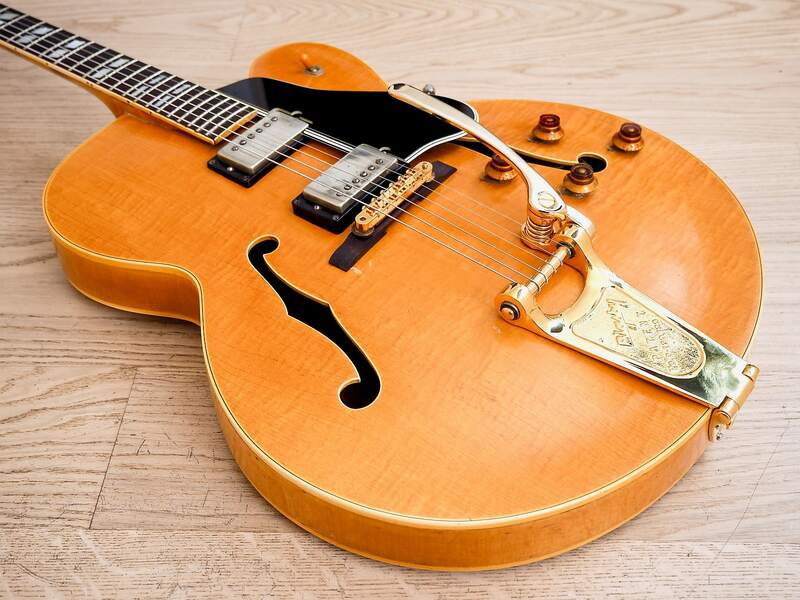 The 2 1/4" deep body allows for a very pleasing acoustic tone as well, and we've had this guitar professionally setup here at Mike & Mike's Guitar Bar with optimal action and fresh 11-50 strings. 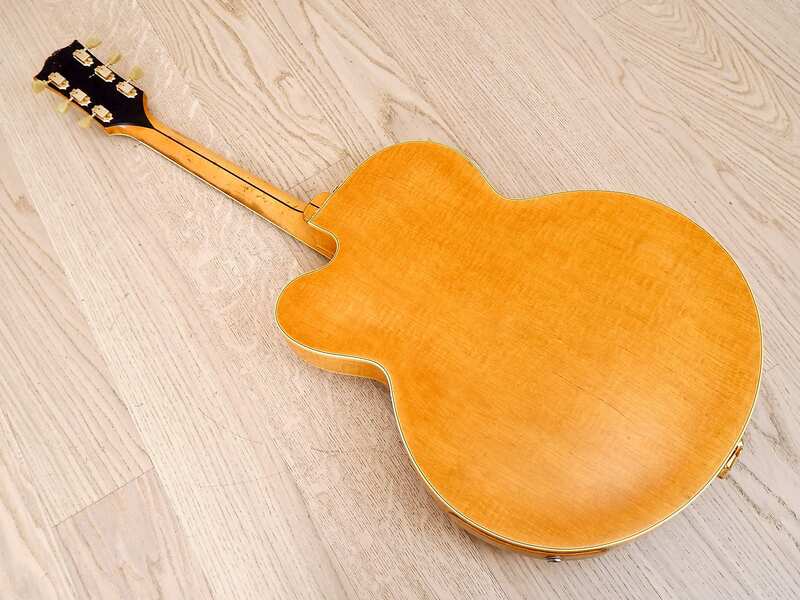 The two-piece figured flame maple neck has a profile truly indicative of the late '50s, with a medium C shape at the nut and more chunky and healthy baseball bat roundness up the board. The profile measures .872" deep at the first fret and 1.021" deep at 10th fret where the profile is already starting to build towards the heel. 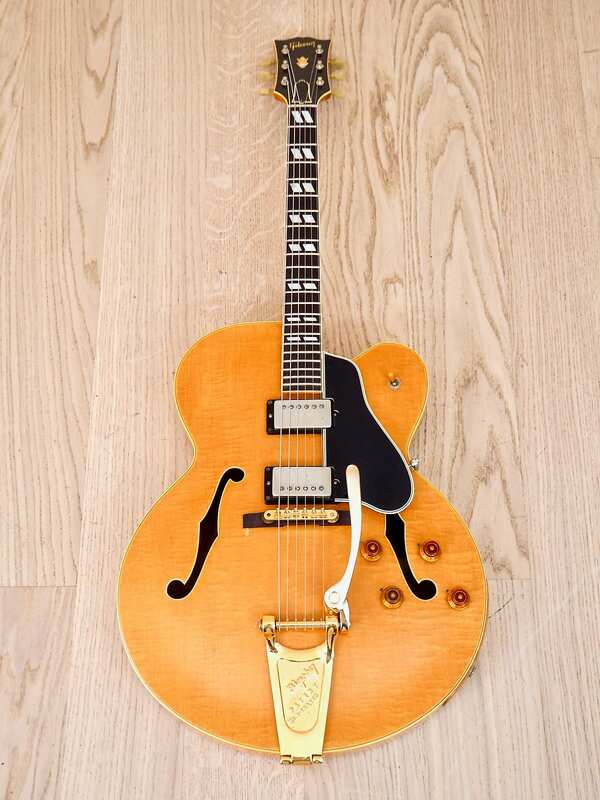 The bound Brazilian rosewood fretboard sports the original split parallelogram pearl inlays and the guitar has been refretted with wire that's shy of medium jumbo yet has good meat, currently showing only light, uniform wear on the crowns of frets 1-3. 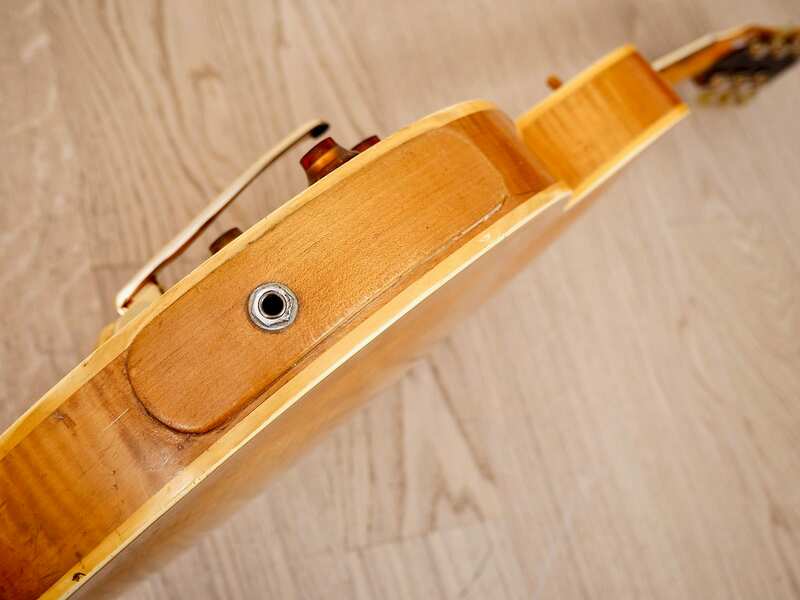 The action is low and comfortable in all registers, the neck is arrow straight, and the truss rod is responsive. The nut measures 1 5/8" in width and the scale length measures 23 1/2". 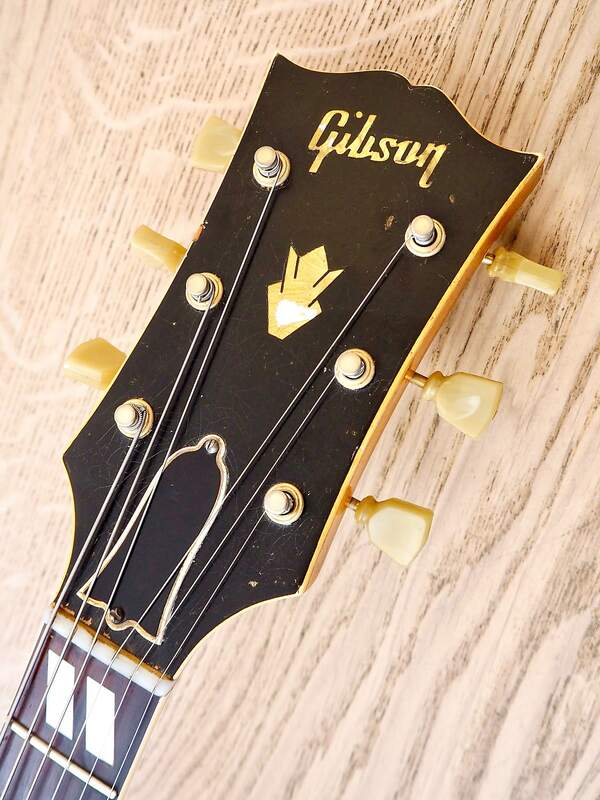 On the headstock, the guitar has been fitted with a set of vintage Kluson Deluxe double line gold tuners, complete with original bushings and mounting screws. 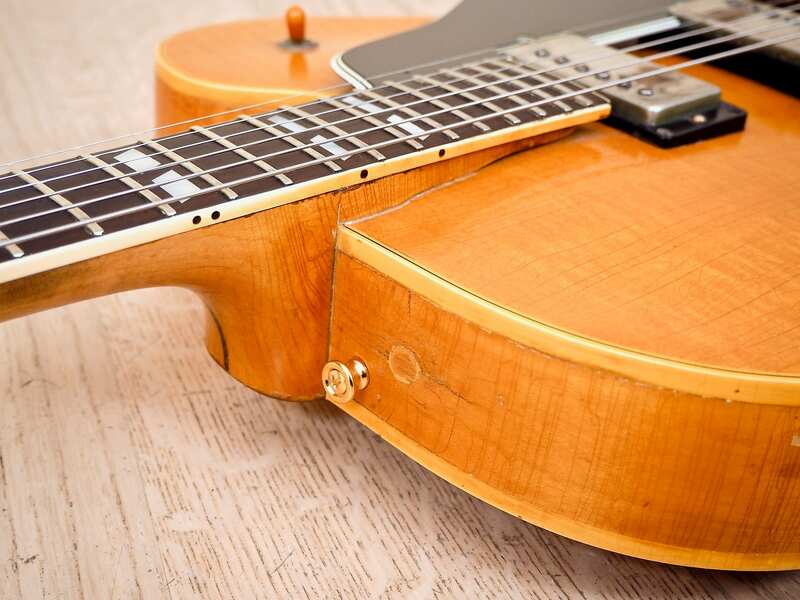 These tuners match both the footprint and design of the earlier single line Klusons perfectly. On the body, the guitar retains the original untouched wiring harness with the large cans still attached over the pots. 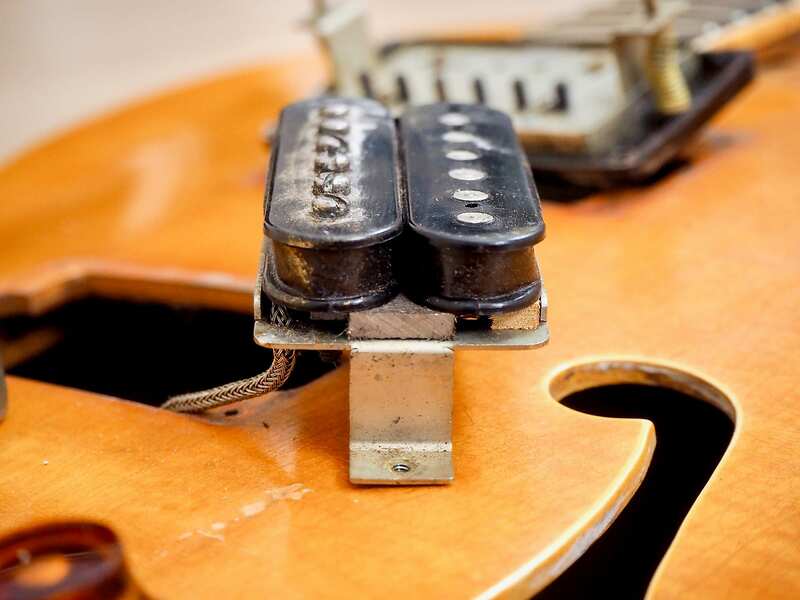 Both PAF pickups have their original gold covers, and while the neck pickup solder on the cover has been lightly touched up and the cover is secured, the bridge pickup cover has been unsoldered in the past, allowing us to view the original black bobbins and untouched pickup windings. 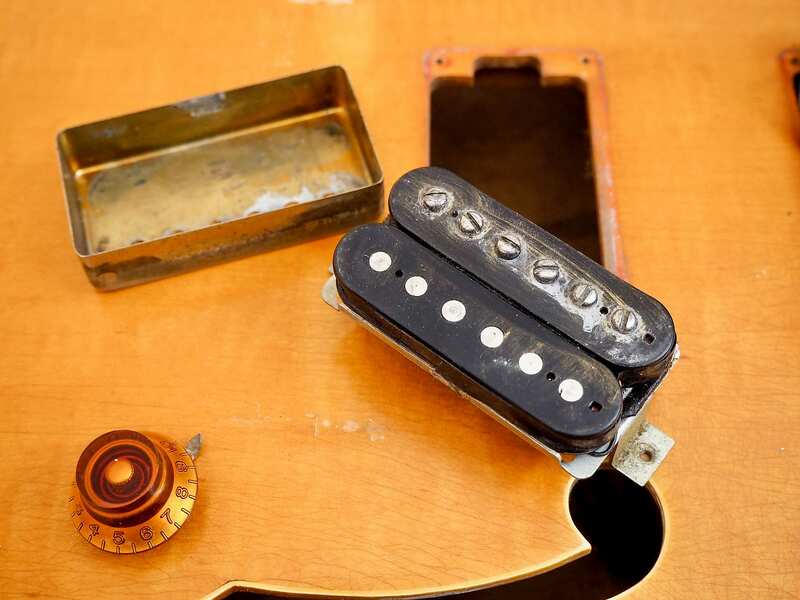 The interior of the bridge pickup cover also retains the original gold plating, as do the original mounting screws on both pickups, which also have their stock pickup rings. As these pickups are the earliest iteration of the PAF, they have no stickers on the baseplates as per factory spec. 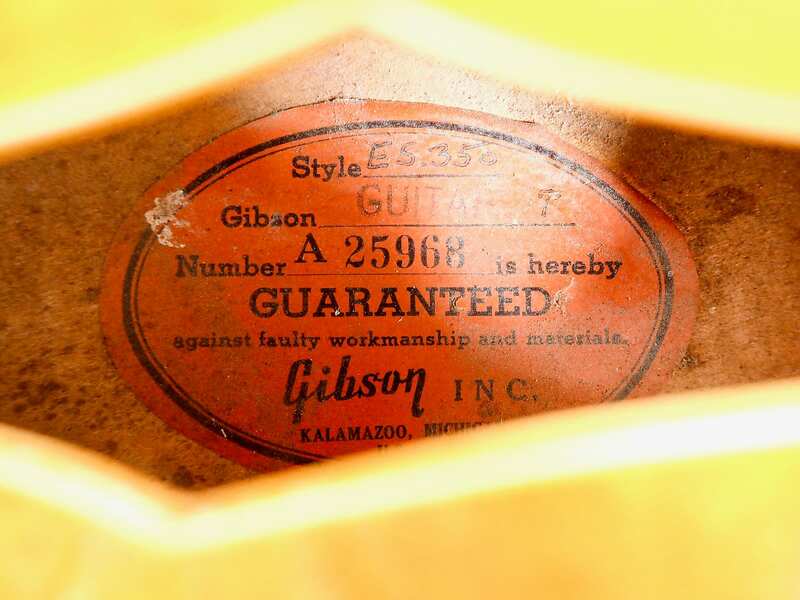 The orange oval label has a serial number which dates to '57, while the factory order number has a "U" prefix number, also correct for 1957. 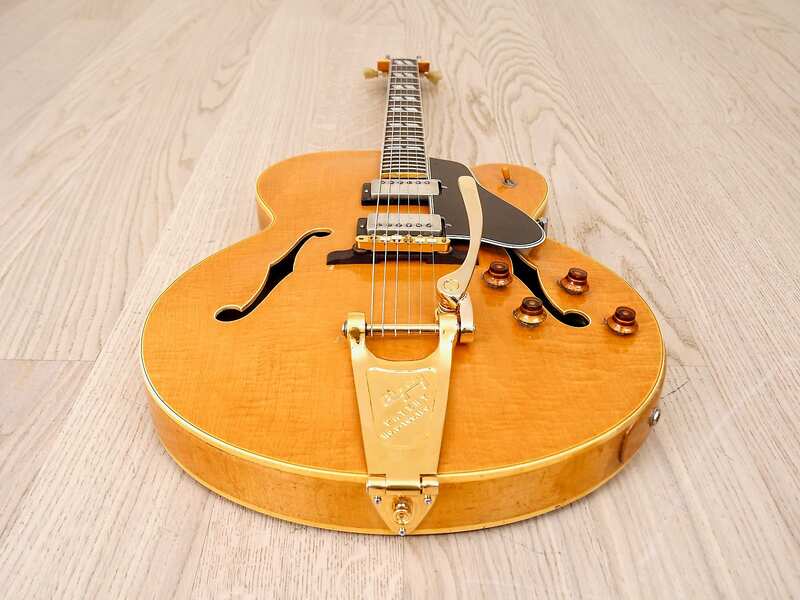 The tailpiece is a modern Bigsby B6 fitted with an upgrade Duane Eddy arm that matches '50s Bigsby spec in terms of arm contour and depth. This vibrato works in concert with the patent number ABR-1 bridge (a later bridge, yet also factory spec) and is extremely expressive. 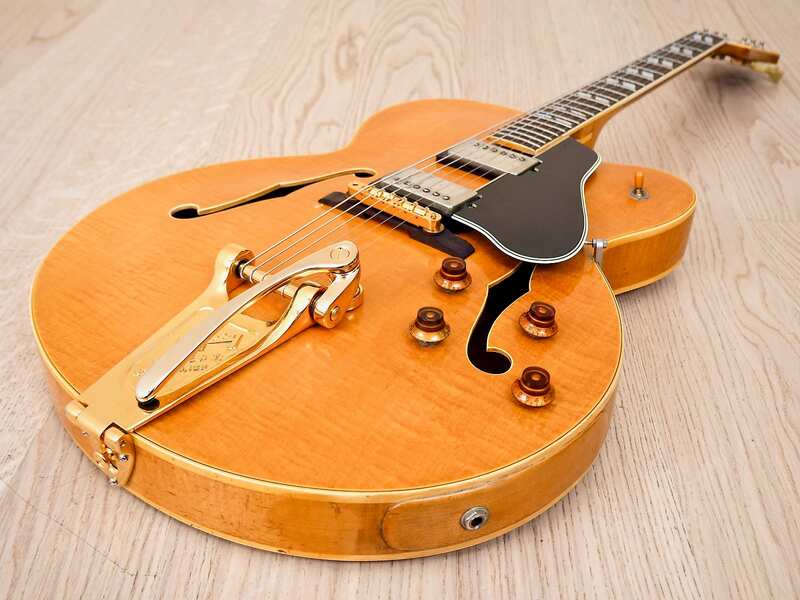 The Bigsby has been fitted with a tall spring so that the arm sits optimally off the body for greater range and a fluid, easy response. 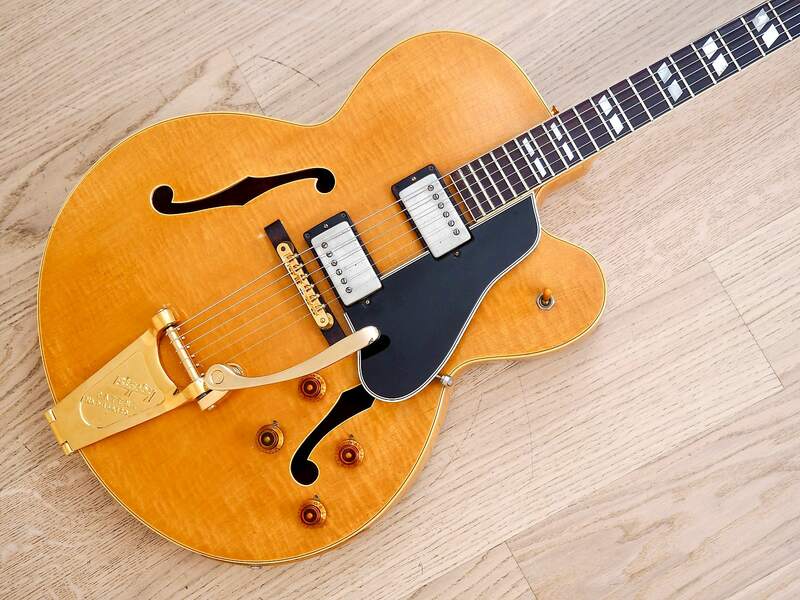 The amber bonnet knobs are modern and uniformly aged, and the pickguard was furnished by Mojoaxe. Also notable, the original amber switch tip is present, a real rarity considering the size of the part and the inherent value of this small component. 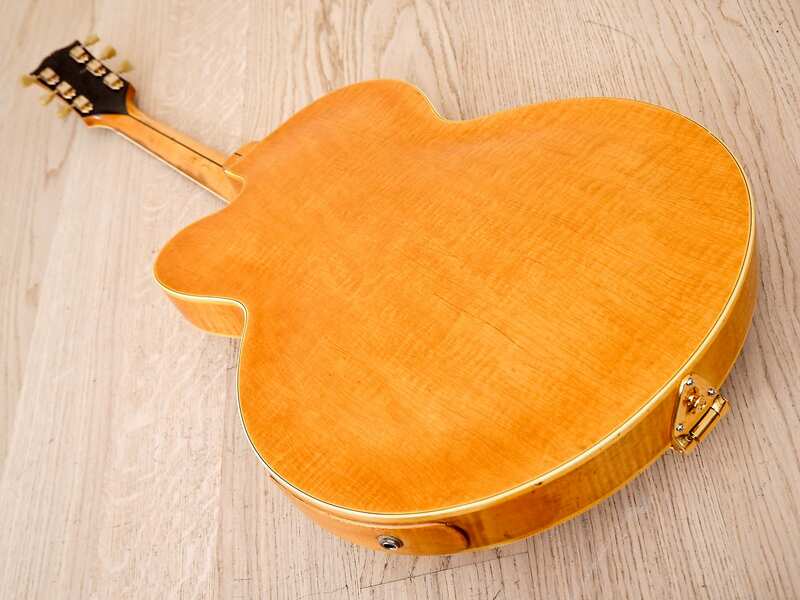 Cosmetically, this guitar is an absolute stunner, with ripples of flame across the entire top, back, and sides. 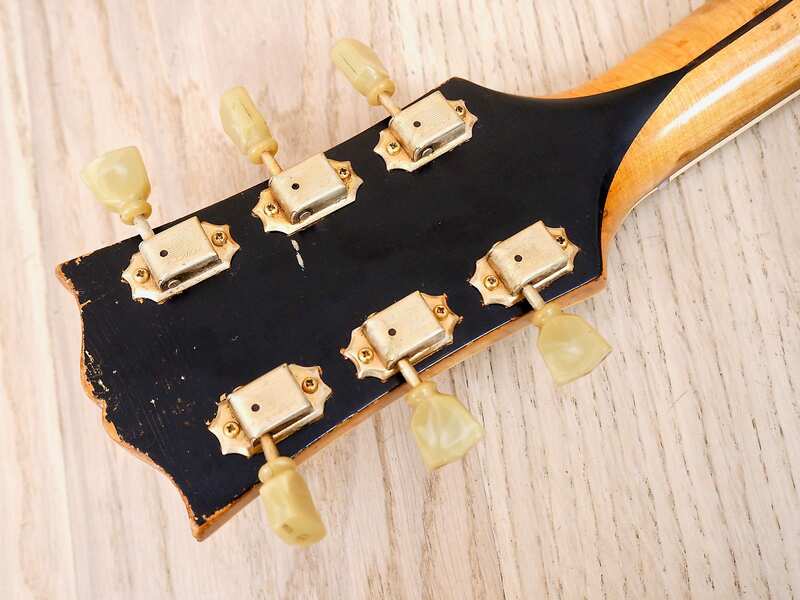 The natural nitro lacquer is original and exhibits light lacquer checking both on the body and the headstock. 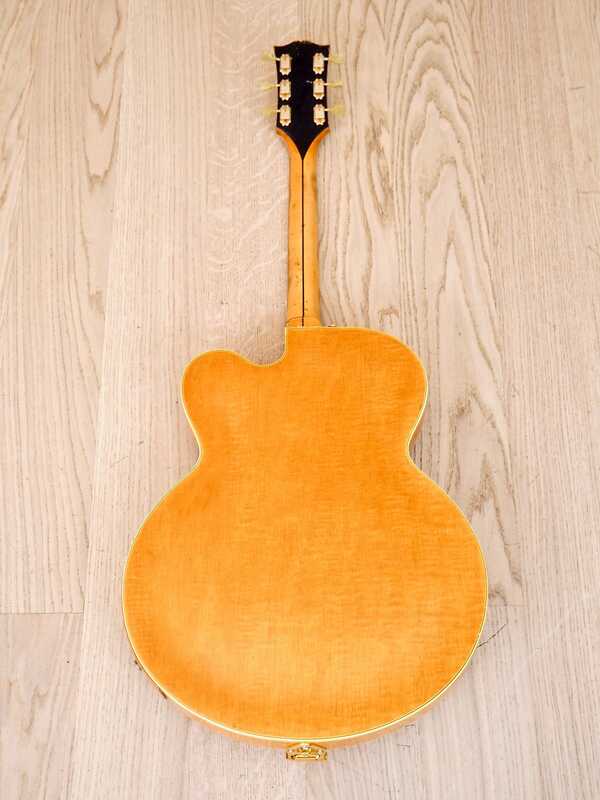 The guitar has zero heel or headstock issues, and a patch has been added to the side of the body surrounding the input jack. Before professionally regluing this patch to the body, we did remove it, and there is a roughly nickel-sized opening around the original jack and no finish remaining under the patch. Finish overspray is limited to the patch around the jack and another small fill where the forward strap button was shifted slightly. Wear is very limited on the body, and the nitro has uniform ambering of the lacquer for a very stately look. 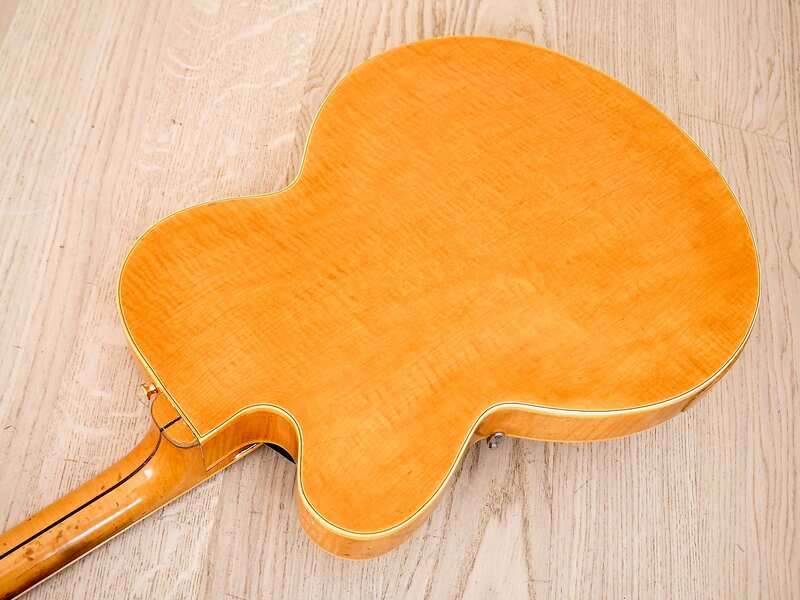 The neck profile is very smooth, with light palm wear on the fretboard edges and only a couple small shallow nicks which aren't distracting to the palm. 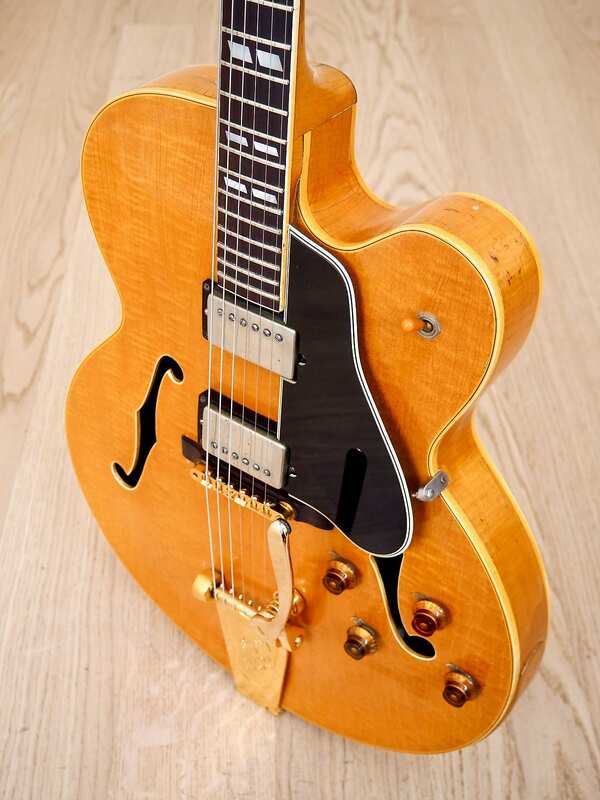 Loaded with the original PAF pickups, dialed in to perfection with fresh strings, and as tonally pleasing as it is visually stunning, this ES-350T is ready for stage and studio use. 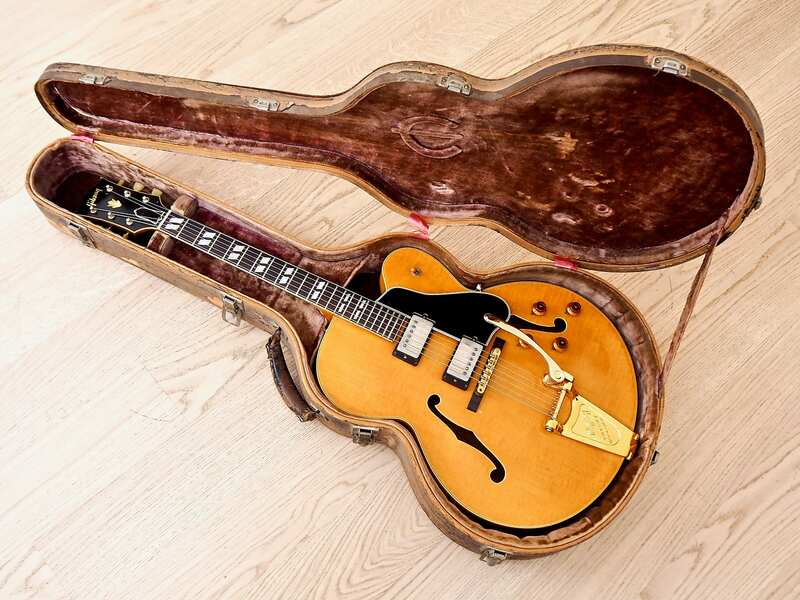 An era-correct hardshell case is included, originally designed for a '50s Epiphone archtop as evidenced by the Epsilon logo on the inside of the case lid. 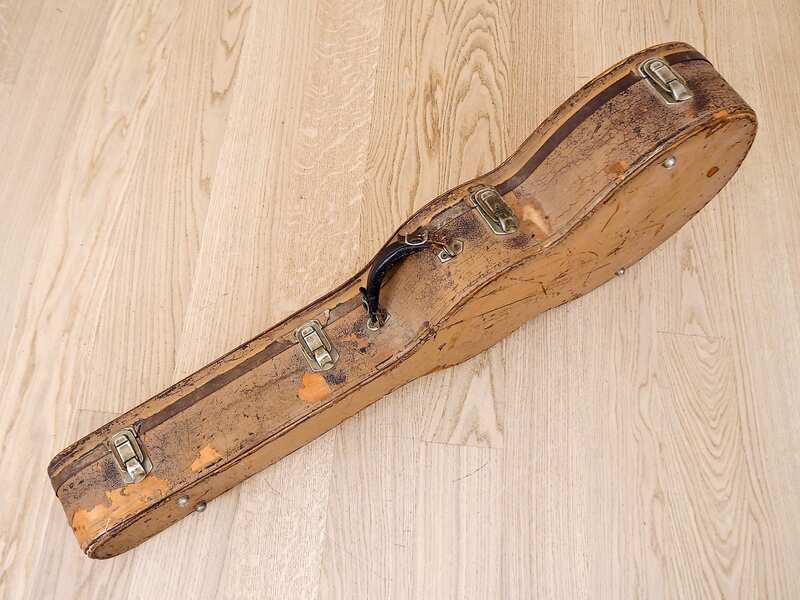 The case has a rough exterior, yet has working latches and is a structurally sound tote for this Gibson. A note on shipping: Shipping in the continental USA will be $225, fully insured and shipped via FedEx Two-Day. Overnight shipping available for an additional fee at buyer's request. We will happily ship WORLDWIDE, but please contact us for an accurate international shipping quote before bidding or buying, as cost varies by buyer location. Based on purchase price of $8,999.99 at 10% APR for 12 months. Excludes tax and shipping fees, to be calculated at checkout. Rates range from 10-30% APR. Choose from 3, 6, or 12 monthly payments. Select Affirm at checkout to get started.